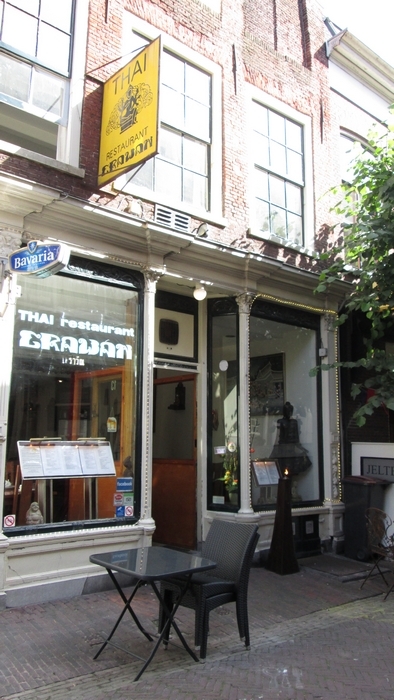 Restaurant review #25 – Erawan is a Thai restaurant in the center of Haarlem (the Netherlands). We were there early on a Saturday evening. We didn’t make a reservation, but as the evening progressed the place soon filled up, so it is advisable to make a reservation if you want to be sure. The menu card lists several vegetarian dishes seperately, of which most appear to be vegan. We specifically checked whether the dishes didn’t contain any egg, and asked which sauce was used to prepare the dishes, and specifically mentioned that we didn’t want anything prepared with oyster sauce. The waitress replied she would give our message to the kitchen. 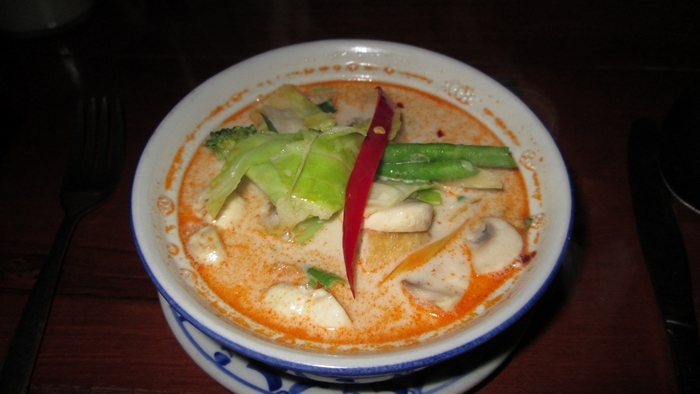 The soup, Tom Kha Tahoe phak (coconut mushroom soup, 6,95€) was quite nice. 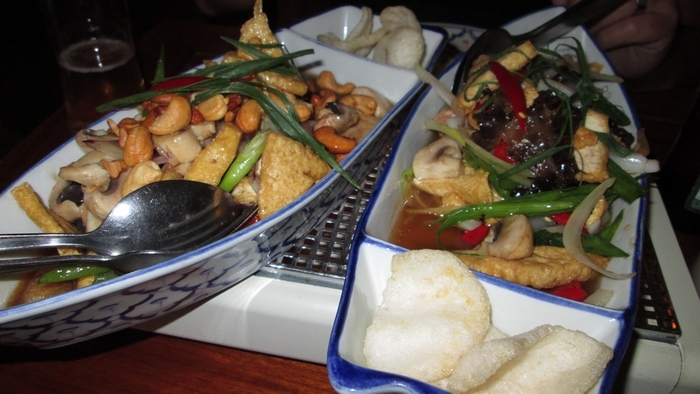 As main dishes, we ordered tofu with ginger and black mushrooms & tofu with cashew nuts and mushrooms (12,95€ each). The dishes were served with plain white rice, and crisps that conspicuously looked like kroepoek (prawn crackers). I asked the lady serving us what they were, and she did (with an ‘of course’ tone) confirm they were indeed prawn kroepoek. I mentioned to her that prawns are not vegetarian, but she didn’t seem to grasp what we were trying to tell her (not in Dutch nor in English). As the crisps didn’t touch the food on the plate, we left it for what it was. When paying the bill, I mentioned to the waitress that the dishes had come with prawn crisps, and that prawns are not vegetarian. She seemed surprised, and only replied ‘but all our dishes are served with kroepoek’. We left the restaurant with an uneasy feeling. The food was nice, reasonably priced, but the misunderstanding about the kroepoek left us wandering how much the kitchen staff actually understand what vegetarian/vegan stands for (and if they make the same mix up about oyster sauce for example). Maybe the dishes were vegan, but the experience sure left doubt in our minds. Don’t think we would go here for a second time if we ever visit Haarlem again. Previous Post50 posts and a new profile pic!